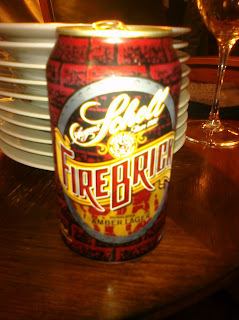 Ok, be honest, did you know that Schell's cans any of their beer (and no, Grain Belt doesn't count)? I don't have any problem admitting that I had no idea. So I've heard that you should learn one new thing every day. I've also heard that alcohol consumption can help ward off Alzheimer's. Combine my new found knowledge that Schell's puts at least Fire Brick, if nothing else, in cans on top of its disease fighting properties and it looks like I'm starting off the week on a good note. Last night we made it to Al’s place for, apologetically, the first time but already the third weekend of the 20th Anniversary celebrations. This weekend: Hop Heads Only. Of the 14 beers I can confidently say I’ve had five of them before, possibly a couple more. Taking advantage of the three 4-ounce pours for $7, it was pretty easy to make it through the list. In the first round I opted for some of the lower ABVs and ended up with Steam Works The Conductor Imperial IPA, Boulder Flashback India Brown Ale and Left Hand Warrior IPA. The IBA hit me as a bit too sweet, The Conductor a bit too malty but the Warrior, right on the mark – num, num hops! Mag took the lead ordering the second round, choosing Poperings Hommel Bier, Flying Dog Double Dog Double Pale Ale and Eel River Organic IPA. No surprise, the Poperings being a Belgian was not for me at all but the next two surprised me. I’m not shy about saying I’m generally not a fan of the Flying Dog stable of beers but this one, this one was pretty darn good! And the Eel River, well, I was hoping for more as I’ve enjoyed the couple of other beers of theirs I’ve had before but this one I found to be too floral for my liking. In the final round Mag picked Urthel Hop-It, Avery The Maharaja Imperial IPA and after a bit of haggling, agreed to include Moylan’s Hopsickle for me in exchange for most of the pint of Surly Wet. Having had the Urthel in Al’s Battle of the Belg Part I, I had no need to try this Belgian again. The Maharaja was good, but a little strong on the alcohol at 10.24%, and the Hopsickle was nicely hoppy but sweeter than I was hoping, probably in part due to its 9.2%. All in all, a nice evening of sampling with friends and a great bartender who always makes sure the beer geeks are properly taken care of. Not much of an inspired title, huh? Really though, keep reading. After going out Thursday night to the Angry Hippie release at Rock Bottom (which is quite a nice beer, but the service, seriously?!? ), we decided to stay in last night. The weather wasn’t exactly conducive to traipsing around, so cold out that I finally broke down and turned the heat on, in part due to the prediction of SNOW overnight. Staying in can be as good as going out sometimes, especially when you invite your fellow beer lovers over. On Thursday I stopped over at my local Cellars and picked up three beers I’ve been hearing good things about: Founder’s Harvest, Goose Island Sophie and Boulevard Saison, hailing from MI, IL and KS respectively, made for a nice Midwest lineup. With the latter two being bombers, or thereabouts, having Kat and Scott over was the perfect time to test them out. The Boulevard Saison was good, certainly no regrets about picking it up, but Sophie really shined. Sophie is a limited release from Goose Island and with the tiny bubbles and pale honey color, is reminiscent of champagne. Not a Belgian Saison fan myself, those characteristics of it were mild enough for me to really enjoy this one. According to Goose Island, this beer is supposed to pair well with brie, so the additional bottles I’m planning to pick up today might have to be paired up the next time around. Founder’s Harvest, which I initially and incorrectly assumed was their version of an Oktoberfest, is in fact a wet hop. Mark insisted that I could not leave the store without buying it and he was right. It’s listed at 70 IBU’s but tastes hoppier and man, does it make my hop loving mouth happy. A great night all around, including the brats, spicy eggplant stir-fry Kat was kind enough to cook up and the bottle of Fallen Apple (Furthermore), my first of the season, courtesy of the McG’s stash.